The bag belongs to the Museum of London collections, and was purchased by the museum in February 1924 from Worship Street, Finsbury, London EC2. Further excavations by the Museum of London Archaeology Service in 2000 in this area of London revealed medieval deposits. However, the bag has been dated by stylistic comparisons, there being no archaeological context for it. The date and (assumed) origin of the bag suggests that it was vegetable tanned, because this was by far the most prominent type of tanning used in Europe in the medieval period. From comparisons to known samples, the leather appears to be calf skin. The bag has been created in a typical style of the period, by folding a single piece of leather in half, and stitching up the sides, then punching holes in the open end through which to thread a drawstring or handle. Bags or purses of this period were worn by men and women on a girdle or belt, and were used to carry small items, including money. The leather of the bag was extremely hard and brittle, with almost no flexibility, and the bag was completely flattened, to be almost two dimensional. The leather in many places was degraded, although the dressing made this difficult to assess. A sticky, waxy dressing had been applied over the whole object. FTIR analysis of the dressing(s) indicated that the dressing included paraffin wax. The stitching at the sides was putting stress on the stitch holes, some of which had torn through, and some of which were in a very delicate state. There was a large hole or tear on one side, the sides of which were held by more stitching. The leather around this hole was degraded and very delicate, and the stitches were putting further stress on the material. The treatment decided upon was designed to remove the dressing from the leather as much as possible, and reshape and repair to represent the bag as originally constructed. The leather of the bag was in a delicate condition, in some areas more than others, and this situation was exasperated by the dressing, which had led to the bag becoming very sticky and therefore dirty. This is distracting from the history and aesthetics of the object. Therefore the removal of the dressing was thought to be advantageous. Removal of the modern stitching and a more subtle mend would better show the object as originally constructed. And reshaping would assist in this process. Before cleaning, the modern stitching was removed mechanically from the seams and the tear. The dressing used on the object was likely a complex mixture of substances; the object was fully immersed in solvents baths of petroleum spirit, white spirit and IMS, in total eight times. Between baths the object was swabbed with solvent to remove the dressing from the surface. After drying, the object reshaped using humidification. It was placed in a humidification chamber constructed from a crate and perforated Corex (corrugated polypropylene) held above a shallow reservoir of water in the bottom of the crate, in order to increase the internal volume of the bag so it might resemble a “bag” shape, with volume to the main body. This would also make it easier to repair the seams..
Several repairs were executed, using a layer of medium weight long-fibre tissue coloured with pigment. For those areas that would not be visible (the seams), the tissue was adhered with 30% w/v Mowilith 50 (a polyvinyl acetate) in acetone. 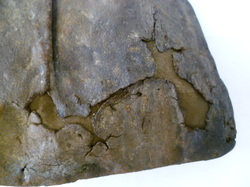 The seams were held together using Mowilith covered tabs of tissue like adhesive tape, and the tear was backed with long-fibre tissue, also held in place with Mowilith tabs (see left). The leather is in a completely different condition to the condition it was in when it came for treatment. The leather is now slightly more flexible, and totally different in appearance, and the leather grain can now been seen, whereas before it was obscured by the dressing. The removal of the dressing has decreased the threat that it posed to the object in terms of deterioration of the leather. Damaged areas are now much more stable and secure, with the support of the adhesive/tissue tabs and backings. These are visible in some places, but subtle and so do not detract from the object itself. The tear is now held in a much less damaging way, and the edges are better protected by being adhered to the backing tissue. The shape of the object is now three-dimensional, so that it more resembles a bag than a piece of cardboard. The modern stitching was confusing, because it did not represent the original construction techniques. The seams have now been attached in such a way that the viewer can imagine the bag as made, i.e. with the stitching on the inside of the seam, but without putting the seams at risk. Overall, the object is now in a much more stable condition, and more attractive to look at. Leather should be kept between about 45% and 55% relative humidity (RH), and importantly the RH should be stable; if the environment is too dry, the leather can become brittle from loss of moisture, and high RH risks mould growth and degradation of the leather fibres. Fluctuations can put stress on the object from dimensional changes, cause brittleness, and may even cause vegetable tans to migrate. Since RH is strongly linked to temperature, the temperature should also remain steady. Localised hot spots can be created by display lighting, for example, and can desiccate the leather and denature the proteins in the structure, so temperatures should be kept low and the potential for such hot spots be recognised. The packaging provided will provide a certain amount of buffering against RH and temperature fluctuations, but preferably the external environment would be controlled as far as possible. Leather can be sensitive to light, and therefore should be stored in the dark when not on display. The packaging should also protect the object from dust and dirt. If the object becomes dirty, it can be cleaned with a brush and vacuum. The object should be handled with care because it is fragile, and the leather and repairs could easily be damaged by careless handling. Gloves should be worn to prevent the transfer of oils and acids from hands.